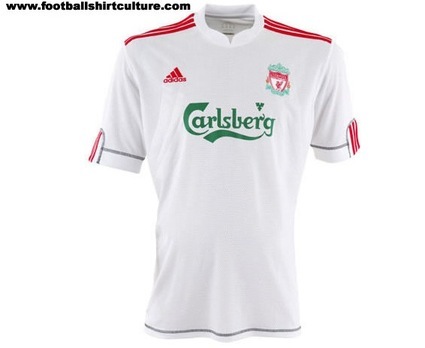 FSC has this leaked photo of Liverpool’s third kit for next season. We like, a lot. It’s simple, and while simple doesn’t always work (I still think England’s new Umbro kit is too plain), this does the job nicely. Interesting to see the sponsor’s name in green, too. Very Christmassy. Good job, Adidas. Liverpool’s new black away kit is also very smart. Like the away kit for this season this is a nice top (I personally really liked last years grey away top as well) I also don’t mind the Carlsberg being green because green is a colour that is also part of our crest and I think if it was in red it might look cheap (if that makes sense to anyone). I know I’m biased but I think Liverpool definitely have the nicest set of kits out of any of clubs kits I’ve seen so far. Much nicer than the grey pajamas. The Reebok kit from three or four years ago looked just like this and even then the sponsor logo was in green. Think this would look much better if the adidas logo and 3 lines were green, just to be different than other white away kits. All the white kits we have had look too samey. be interesting to see what the shorts and socks will be like? if both are white then it will look a bit poor! adidas need to design the kits with more imagination! i would love to see a liverpool kit with green jersey and white shorts with green socks! I think it is nice and better than last seasons third kit.